Plants are made up of a high percentage of water and, as well as being essential to their survival, water is also the means by which nutrients are drawn up from the soil through roots and stems into leaves and fruit. So, good irrigation is a high priority in gardens – as important as strong sunlight for most crops. Once past the seedling stage, most vegetables and fruit require the equivalent of about 1 inch of rain per week and, as long as they are in free-draining soil, providing more than that can further boost growth. The first thing to consider when planning irrigation is that traditional watering methods are inefficient. Watering your garden from above during the heat of a summer’s day is a great way to waste water, as water that falls on leaves quickly evaporates, never reaching the roots. Water on leaves also makes plants more susceptible to diseases spread through spores in the air, such as blights, so you should always water the base of a plant, not its leaves. A lot of gardeners water little and often. This is great for small seedlings but once the plants become larger it can mean that only the top inch of the soil is ever dampened. For crops that put down deep roots, watering more heavily but less regularly can help build up reserves of moisture deeper in the soil, making them more resistant to hot dry spells of weather. To reduce evaporation, add a dry mulch on top of the soil such as a thin layer of dried grass clippings, comfrey leaves, hay, straw or wood chip. Water can seep through this layer but it doesn’t evaporate quickly and the soil below is kept moist. If you suffer from slug damage in your garden, it’s best to only apply mulch during summer as during damp seasons slugs can multiply under the protection of soft mulches. For big plants such as tomatoes, burying a plastic bottle with a few small holes punched in the bottom can provide an extra water reservoir. Screw the cap on the top and water will slowly percolate out into the surrounding soil, providing a consistent water source. Combine this with guttering and water barrels and you can end up with an eco-friendly solution that stores excess water during wet weather that you can use efficiently during dry periods. What if you are away from your garden for extended periods and don’t have someone to water your plants? That’s where drip irrigation can come in handy. By automating the watering using a timer and delivering water exactly where it’s needed it can be an efficient way to irrigate crops. 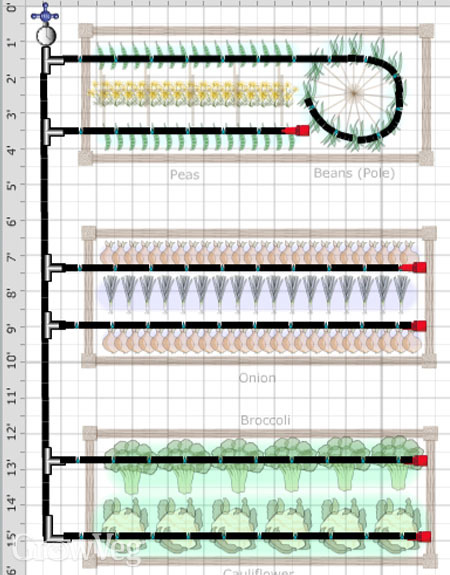 You can use our Garden Planner to plan drip irrigation by selecting the Irrigation layer from the toolbar. This makes it easy to work out just what you require. A timer controls when the watering should happen. Typically this will be 10-15 minutes in the morning and/or evening. It’s a good idea to include a filter to ensure that nothing passes through that can clog up the drip irrigation holes. A pressure regulator will prevent the water pressure exceeding what the drip pipes can handle – usually around 30 PSI for a small garden. To pipe water to where it’s needed, half-inch supply tubing is ideal as it’s easily fixed to walls, cable-tied to other pipes or buried under pathways to avoid tripping over it. It’s important to identify any sharp bends as this could restrict water flow if the tube kinks. To prevent this, it’s usual to cut the tube and insert a 90 degree elbow at each corner you have to go round. T-junctions can be used for line that comes off the main supply and each length needs to be finished with an End. Once the supply tubing is in, it’s time to add the drip line. The easiest way to do this is to punch a hole in the main tubing and insert a transfer barb which feeds thinner quarter-inch tubing up to where the water is needed. This is then connected to quarter-inch dripline to supply the plants. Several different patterns are commonly used when laying out the tubing. For plants in rows, dripline is run along the beds, kept in place by U-shaped hold-downs every 3 feet or so. For more densely grouped plants you might choose to snake the dripline along the bed. In the Garden Planner you can draw this by holding down the Ctrl key on a PC or Cmd key on a Mac to add lines for each quarter turn, then curving them using the middle handles. For square or circular beds a spiral layout can work well. Containers on a patio or deck can also have lines branch out to them. In each case the rule of thumb is that quarter-inch dripline can only feed around 15 to 20 feet, so if you need to go longer than that you’ll need to run another length from the supply tubing. Larger bushes and trees will often have their own supply, either half-inch emitter tubing or, if they are spaced out, you can use half-inch supply tubing with emitters inserted into it. Circle the tree so that roots are encouraged to grow out rather than stay in a tight rootball. Finally, it’s fine to put a layer of dry mulch over the dripline as long as it doesn’t become buried into the soil which can cause back-suction of dirt, causing the drip holes to get clogged up. These simple design principles work well for small to medium gardens with an equivalent of up to six 4’x8’ beds. For larger gardens, you’ll need to run more than one supply line and consult your supplier to calculate whether the water pressure you have is sufficient. When your design is complete, just click the Parts List button where the Garden Planner has calculated the number and length of parts required. Add around 10% to the totals for any lengths of tubing to make sure you have a little spare when installing it. With your plan and parts list, you’ll find it much easier to put in place a reliable system to ensure that plants get the regular watering they need.